Public Produce makes a uniquely contemporary case not for central government intervention, but for local government involvement in shaping food policy. In what Darrin Nordahl calls “municipal agriculture,” elected officials, municipal planners, local policymakers, and public space designers are turning to the abundance of land under public control (parks, plazas, streets, city squares, parking lots, as well as the grounds around libraries, schools, government offices, and even jails) to grow food. Public agencies at one time were at best indifferent about, or at worst dismissive of, food production in the city. Today, public officials recognize that food insecurity is affecting everyone, not just the inner-city poor, and that policies seeking to restructure the production and distribution of food to the tens of millions of people living in cities have immediate benefits to community-wide health and prosperity. This book profiles urban food growing efforts, illustrating that there is both a need and a desire to supplement our existing food production methods outside the city with opportunities inside the city. Each of these efforts works in concert to make fresh produce more available to the public. But each does more too: reinforcing a sense of place and building community; nourishing the needy and providing economic assistance to entrepreneurs; promoting food literacy and good health; and allowing for “serendipitous sustenance.” There is much to be gained, Nordahl writes, in adding a bit of agrarianism into our urbanism. Darrin Nordahl is an award-winning writer on issues of food and city design. He completed his bachelor’s degree in landscape architecture at the University of California at Davis and his master’s degree in urban design at Cal-Berkeley. He is the author of Making Transit Fun!, My Kind of Transit and Public Produce. Born in Oakland, California, Darrin grew up in the quirky yet stunningly beautiful cosmopolis known as the Bay Area, but lived for many years in America’s Heartland. His work is thus a mélange of “Left Coast” idealism and Midwestern pragmatism, and has generated headlines in newspapers and network news stations throughout North America. Merging his passions for food and cities, Darrin speaks to audiences across the United States and Canada, arguing how thoughtfully designed city spaces can help improve the quality of the environment, our health, and our social connections. 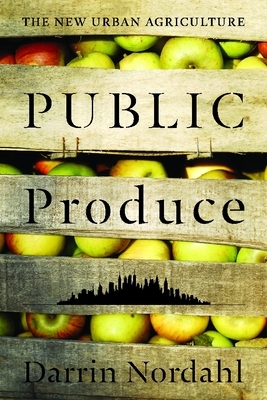 "Public Produce is a wonderful primer for students, planners, designers, and activists for food security and urban produce. Nordahl's personal and down-to-earth style will educate and inspire the average citizen interested in food policy or urban design, and his expertise in urban issues will give clarity to professional planners and designers on this complex subject." "Darrin Nordahl, director of Iowa's Davenport Design Center, has written a paean to urban agriculture in Public Produce: The New Urban Agriculture. Nordahl is an advocate of 'fresh produce grown on public land, and thus available to all members of the public-for gathering or gleaning, for purchase or trade.' Nordahl deals effectively with issues such as food literacy, maintenance, and aesthetics." "Nordahl is a visionary who shows how easily cities could promote urban agriculture to the great benefit of all concerned. This book is at the cutting edge of today's food revolution. Read it and get your city council to sign up!" "What Darrin Nordahl envisions in this lively book is nothing short of a revolutionary way of seeing cities, a kind of 'edible urbanism.' This is a book that will likely shape the urban agenda for years to come."